It seems like the perfect solution: hotel mogul Alex Porter will manage his sister's small-town bed-and-breakfast while she honeymoons. But he gets more than he bargained for when he finds himself clashing with feisty caf� owner Kate Nichols. Suddenly he's organizing church outings and playing surrogate dad to the foster children Kate takes in. Alex is used to taking charge -- but not like this! If he isn't careful, this big-city executive just might lose his heart to Mirror Lake's favorite hometown girl. This book was about Alex Porter, rich hotel tycoon who believed in perfection and remaining impersonal in the business world. After loosing their parents when he was in college, he took over the family business of hotel management and raised his teenage sister - someone he felt he had to protect. She'd been kidnapped as a young child, and the family had been traumatized over the event. 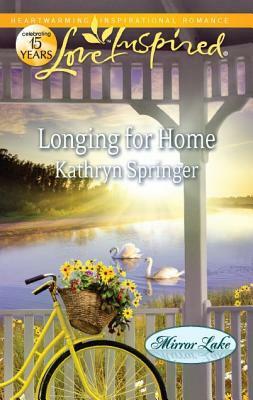 But when his sister, Abby, takes off to Mirror Lake to open her own bed and breakfast, then meets the man of her dreams, Alex's perfect world suddenly sways out of control. He's not happy that Abby is practically leaving him out of all the decisions of the wedding and shows up early to make sure Kate Nichols, cafe owner, doesn't take over! Kate is a spitfire, though, and can give as well as she gets. She doesn't show Alex any mercy when he tries to throw his weight around. Then when a turn of events almost causes Abby and Quinn to cancel the honeymoon, Alex (as the protective big brother) and Kate (as the best friend) agree to run the bed and breakfast until the couple return. The two weeks that follow is full of magical moments, heart-stopping confessions, and drama that will leave you turning the pages! Alex's transformation was completely believable and sweet. By the end of the book, you are no longer looking at this man in a negative light and will love him as much as I did! He did everything out of sincerity and love, even if it did blow up in his face. Though what he does to fix it is very predictable and expected, it was swill endearing enough to be enjoyable to read about. The final drama that happens in this book was a bit of a surprise, but I suspected it was coming once the scene started. This is my favorite of the series so far!